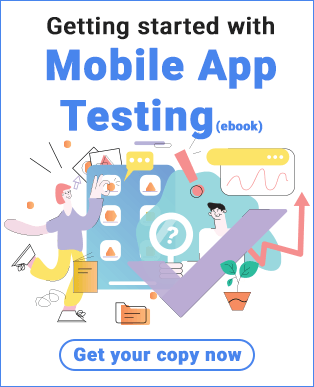 3 years back pCloudy came into existence to disrupt the mobile app testing eco-space. 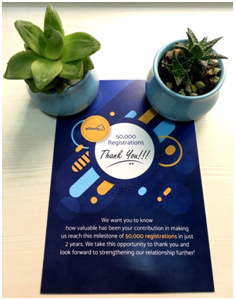 We are proud to say that today we have achieved 50000 registrations in such a short span of time. More than 50,000 users have registered with pCloudy, and over 20,000 of them signed up just this year. It would not have been possible without our users’ constant trust and support. Do you know what makes us proud? What really makes us proud is to see that we have trusted customers now spread all over the world!! It’s an just an indication of what’s yet to come, we are geared up for way more! 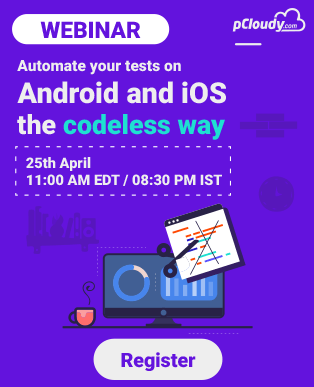 As we look ahead, these results give us the inspiration to continue working towards making mobile app testing seamless and future-ready. Now, let us talk about all the fun, excitement, surprises and rewards that unfolded throughout the day. And the best part was there were surprises for both customers and employees. 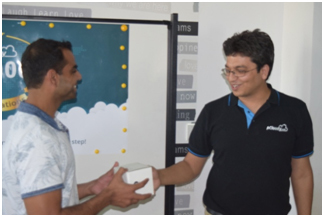 Moving towards the surprises for customers, thank-you gifts and cards were sent to our loyal customers as a token of our gratitude. We also sent tokens of appreciation to all the new users who registered on our platform on this day. We also had a special gift for the 50,000 user who registered on pCloudy yesterday. 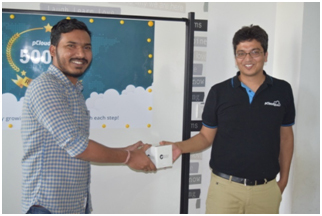 The winner of this special gift is Srinivas Chitturi. Many congratulations to the lucky winner! Moving on to the fun events planned for pCloudians, I am sure each one of us had a blast throughout the day. Surprises started to unfold as soon as we entered office. 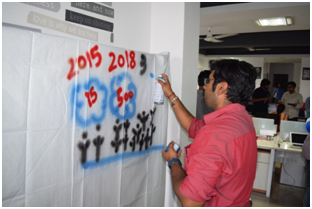 The entire office was decorated in blue, white and red balloons which actually gave each one of us a happy feeling. 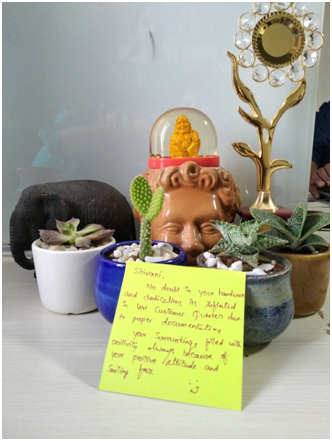 Next, I reached my workstation and wow it had the most wonderful comment for me kept in front of a beautiful desktop plant with a gratitude message from our Co-founder Avinash Tiwari -“Thanks for walking 50,000 miles with us”. What else could you have asked for! It was the most wonderful feeling any employee could expect. 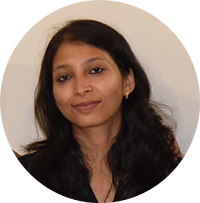 The organizers of the event did a wonderful job in keeping the next event in line, a surprise which made all of us a bit curious about what’s coming up next. 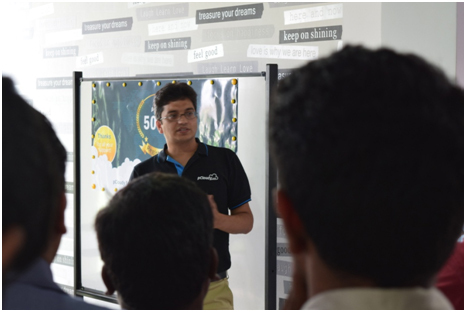 Avinash addressed all the pCloudians with the most motivating and goal-oriented speech. Hey! it was neither boring nor a long speech so everyone was hooked to it till the end. 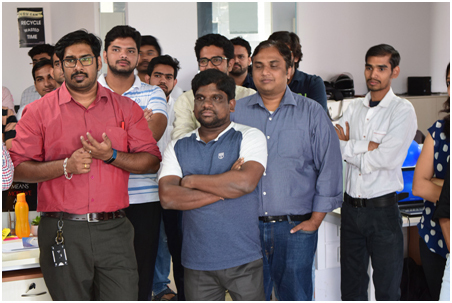 All of us came to know about the journey of pCloudy and the goal each one of us has to focus for the coming year. And, the most important about the raises and hike. Now you know… why everyone was hooked to his speech till the end. Some of the oldest pCloudians were facilitated for walking these 50,000 miles facing all the ups and downs with it. Now that pCloudians were motivated, we got the most interesting thing to do. 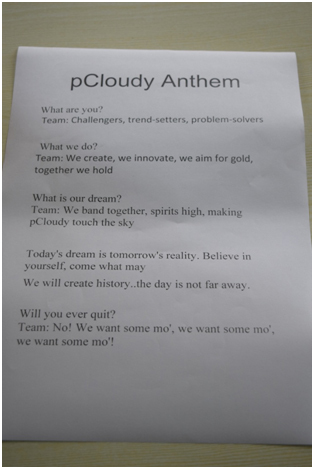 We recited the pCloudy anthem. Do you want to know what it is? It is about pCloudy values and goals. 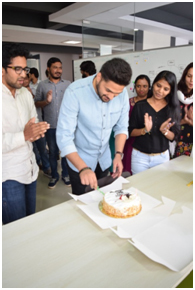 It was followed by cake-cutting and fun-games. 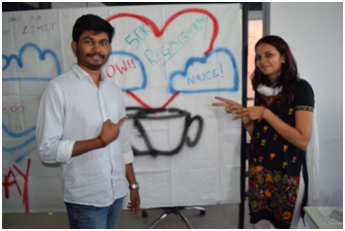 Each one of us was asked to create graffiti on either “Walking 50000 miles with pCloudy” or “Tea time talks at pCloudy”. No wonder we have some hidden talent among us. You yourself have a look at it. 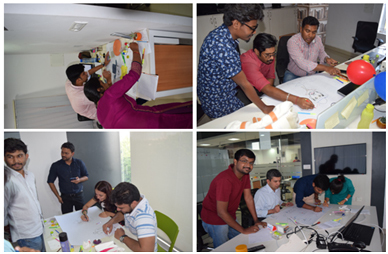 There was a team activity – Poster making competition which was again thrilling as teams were asked to make a poster in 30 minutes on any of the 4 topics – pCloudy’s core values, The way we work @pCloudy, The most wanted @pCloudy and Advertise your team. The posters that came out at the end of half an hour were worth appreciating. Artists or non-artists all made the best use of this opportunity to showcase their talent and came out with some hilarious perspective of working at pCloudy. All the posters were outstandingly imagined that we rolled on the floor laughing. 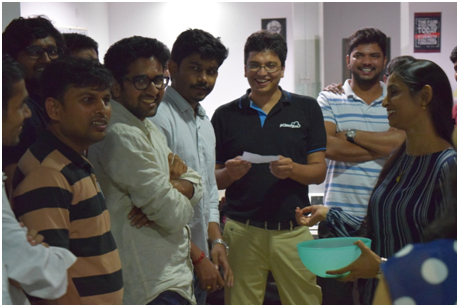 And, our jury had a difficult time deciding the winner and so all were declared as winners. Last but of course not the least in line was the game – How well you know your colleagues. 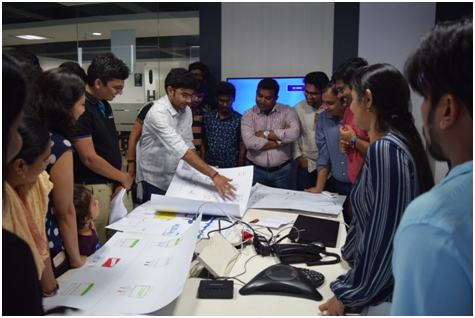 There were chits with some unique feature about each employee and the pCloudian who picked up the chit had to identify the colleague. It was the best as all of us had our sides split laughing on the comments made in the chit. And the best part was the comments were funny without offending anyone. The day ended with all of us attacking on pizzas and beverages.